Letterhead is rated 3.1 out of 5 by 7. "By using PrintPlace, we have saved at least 50% on our expenses." Rated 5 out of 5 by LeAnn from Corporate Letterhead Looks GREAT! We have printed our letterhead with you several times and it is consistently of excellent quality. Rated 4 out of 5 by Brittani from Well done! We were pleased with our letterhead. The only thing we wished were different was how it was packed in shipping. The edges were bent on some of our letterhead. Rated 3 out of 5 by Black from Decent Order more than you think you need because they don't all line up. About one out of twenty are misaligned and unusable. Other than that, they are what you would expect for letterhead. Don’t just stick a logo on a piece of paper and call it your company letterhead. Your organization’s image deserves better. You need to appear trustworthy in your announcements, proposals, sales letters, and other written documents. Instead, you should make letterheads and make a statement. Take your stationery to a new level with full-color letterheads. Custom letterheads can give your brand a boost of professionalism. Pair it with our matching envelopes to maximize your brand’s business identity. Our premium letterhead matches our 70 lb uncoated text stock for envelopes and business cards. Complete the cohesive branding by printing matching envelopes, as well as designing complementary presentation folders, notepads, note cards, and labels. Below are letterhead layout templates to help you set up your company letterhead. Follow the specifications provided to ensure your artwork prints correctly. We have letterhead layout templates in Illustrator and Photoshop formats for your convenience. Make your business letterhead designs stand out by printing in full color. This will make every note you write or letter you print grab the recipient’s interest. You can also simulate a custom watermark by adding a design or image and screening the opacity. If you regularly need to store and organize documents printed on company letterhead, consider adding hole drilling to your job. PrintPlace offers different hole drilling options to help you find the right amount and size for your binder. Including a perforation near the bottom of your letterhead easily creates a tear-off strip. Print a special offer for new customers or use it as a remittance slip. 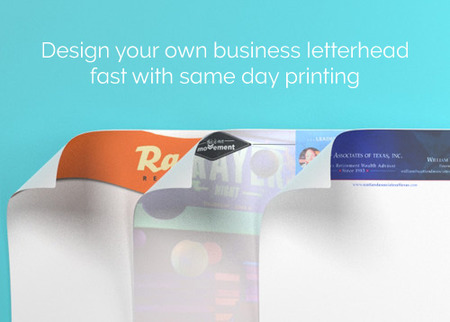 If you are printing personal letterhead, you can make it look more alive by taking advantage of the 2-sided printing option to add graphics or a design to the back side. This would really stand out; enhancing your image and the message you are sending.